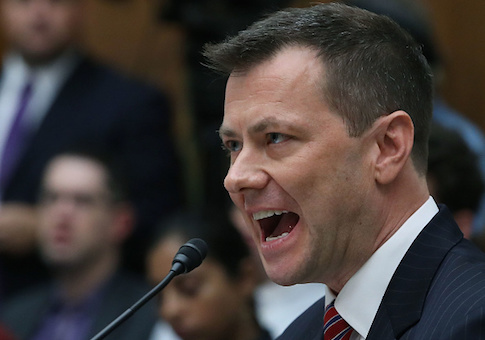 The FBI has fired disgraced agent Peter Strzok, who has faced accusations of bias after it was discovered he sent numerous anti-Trump text messages in the lead up to the 2016 presidential election. FBI Deputy Director David L. Bowdich ordered the firing, according to Strzok's attorney, Aitan Goelman, the Washington Post reports. Prior to Monday's firing, Strzok had been given a 60-day suspension and demotion by the FBI’s Office of Professional Responsibility. "This isn’t the normal process in any way more than name," Goelman said. Strzok had been one of the agents in charge of investigating Russian interference in the 2016 election and previously was part of the investigation into Hillary Clinton's use of a private server during her time as secretary of state. He quickly became a controversial figure after text messages between him and an FBI lawyer, his mistress Lisa Page, came to light showing his strong disdain for President Donald Trump. On July 12, Strzok appeared before the House Oversight and Government Reform Committee and exchanged many sharp words with Republican lawmakers who criticized him for exhibiting bias in his role in major investigations. Many Democrats simultaneously defended him. In June, Strzok, while still employed by the FBI but under investigation, was escorted out of the agency's headquarters. This entry was posted in Issues and tagged FBI, President Trump, Robert Mueller. Bookmark the permalink.